1 Preheat oven to 450°. 2 Combine Mayonnaise, cheese and garlic powder in small bowl. Brush both sides of chicken with mayonnaise mixture, then coat in bread crumbs. Arrange chicken on baking sheet. 3 Bake chicken 20 minutes or until chicken is thoroughly cooked. 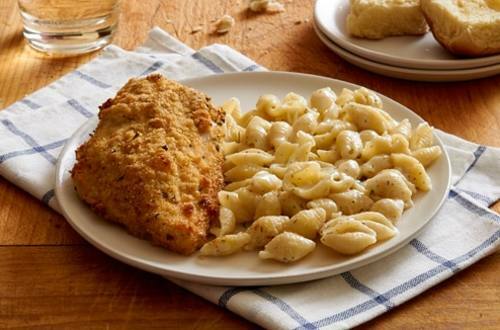 Serve with Knorr® Italian Sides™ - Creamy Garlic Shells.